This dessert wine is made with Muscat grapes, which are often used to produce sweet wines and fortified wines. Its color is light amber with rose tinges, and its nose is nectarine with subtle floral qualities including that rose again. It tastes wonderful. Certainly sweet, as expected for a dessert wine, but it’s not syrupy and the alcohol burn is gentle. The taste is predominately nectarine with maple and light butterscotch notes. I love it! You may be surprised that loving a dessert wine is more my exception than my rule. 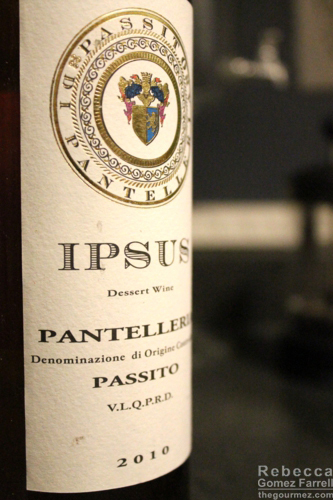 The Ipsus Passito di Pantelleria is a gorgeous honey color that reminded me in its tone and thickness of some of the Chardonnay ice wine I have enjoyed. Once I sampled the Ipsus Passito di Pantelleria, I found that comparison to be even more accurate. This Moscato was very thick and sweet with a lot of honey and orange. I was surprised by how much I enjoyed the Ipsus Passito di Pantelleria Moscato. My expectations were mixed, but by the end of the bottle they had been thoroughly exceeded. Sweet but balanced, with flavors of caramelized peach, orange zest, and honey. A-. My (real Italian friends often have this and I found a bottle and a half of Passito Ipsus left at our house. I’ve had it in the middle of conversations when proffered but, being more of a beer, mixed drinks, and dry red wine kind of guy, I never really stopped to appreciate Passito by itself. A bit short on beer and spirits, and looking for just a little something, the Passito Ipsus caught my attention. Sublime. Its color and flavor representative of its dried grapes (think raisins)source with a scent of pecans and a taste reminiscent of honey-sweetened apricots. Where can we buy it in New York City? Gianfranco, this bottle was purchased at Trader Joe’s. That said, they may not carry it anymore!